Playa Bajamar beach with best, free Tenerife pool complex. What's so great about Playa Bajamar beach? New beach Playa Bajamar by the pools. 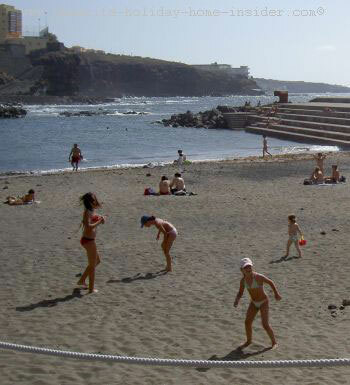 The Playa Bajamar Tenerife beach was not like in 2013 when I visited it in 2004 and then again in 2008. It was better every time. In 2008, happy, barefoot children in pastel colored swimming costumes were running around on its soft sand which was neither black nor white. Its location is halfway between Tejina and Punta del Hidalgo at a mere 5 to 7 km respectively by the North Western end of Tenerife. 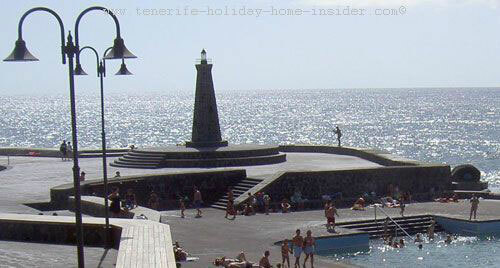 However, note that the advantages of this Tenerife beach enclave off the beaten track don't stop here. Now, there even is a onramp to help disabled persons to enter the pools without help from others. The slightly descending ramp was designed with a rail. This facility for the handicapped is 21m (about 63 foot) long and 2,70m (about 8,5 foot) wide. How get to Playa Bajamar Beach fast by car ? to Bajamar until Punta del Hidalgo. You find the beach by turning into a road without visible name between a pharmacy and a triple story blue house on Carretera General Baja Mar/Punta del Hidalgo which is the main road. On the bottom you walk down some steps until you reach an open square facing the new beach Playa Bajamar. At first sight you don't see the sand of the beach because, the dark, pointed Playa Bajamar faro the lighthouse draws your gaze like a magnetic tower. It stands on a sort of elevated, very wide, roundish podium. Everything else you make out is almost square, massive and large. A perhaps 200 meter long wall with 6 steep steps leads to the left off the elevation with the modern lighthouse. 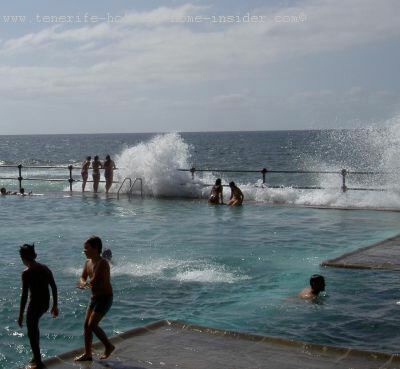 Safety of the Bajamar saltwater pools? The gigantic long break-water structure protects the beach Playa Bajamar in front. More steps to the right of the Faro face two huge natural swimming pools plus one for kids at the end. I was in company of a friend who knows every beach and natural pool on the biggest of the Fortunate Islands. No photo of myself was taken there, except earlier on by the beach Playa el Arenal. That was during the same trip to Punta Hidalgo. 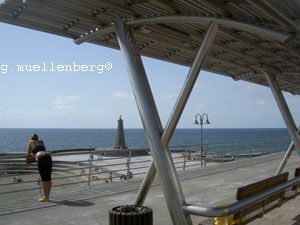 The basins with their solid pool fences in between sturdy metal poles are fed by the Atlantic. The salty, healthy, powerful waters splash over the pool edges. Sometimes, they almost come up like fountains. The never tiring ocean provides great thrills to the bathers. Nevertheless, everybody feels safe. The sandy beach - to the contrary - is rather a calm corner at the side. The way in which the whole place has been designed and adapted to the overpowering nature by this little town in the very north of Tenerife was the idea of a genius. He found a perfect solution ideal for its geographical location applying simple but, top architectural design. The best materials were good enough, such as stainless steel. All is supposed to require low maintenance and to withstand the gigantic sea for a long time. More than one stainless steel roof shelter of exceptional modern design gleams silvery in the early afternoon light. That oscillates as if its surface was sprinkled with billions of diamonds kissed by the Tenerife sun. Underneath, wooden benches invite to take a seat. Even the trash baskets beside them have style. Walking by this long terrace which is at least 150 meters long you could proceed to the children pool at the end. Make out the stage below and beyond from this veranda lookout. Spot tanned people looking like actors from afar which are clad in swim ware. However, stage scenery or background are never the same at beach Playa Bajamar. A few old fashioned tall black lamp stands rise to the sky. They are, almost, bizarre, focal points against the anthracite colors of all that's made of stone. Light timber on top a long slightly curbed wall where people can sit breaks the monotony, too. The spectacle is for free. Toddlers and people which don't know how to swim love to refresh by the large, round Bajamar public children pool. It is the smallest of all three water basins. The Beach Bajamar complex is a generous place for family fun activities which cost virtually nothing. 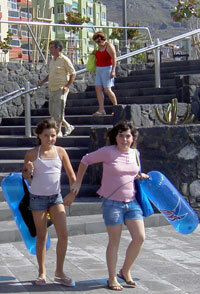 It's an ideal destination for weekend trips on the island as well as for special Tenerife holidays. Change rooms with showers and toilets may be used for a small fee. Plants are scarce at the beach and pool complex Bajamar except by its entrance and main walkway. There, little baby trees only just started to grow. A couple of very young Bajamar girls entered the pool and beach complex with happy faces when we left. The recreation beach spot of Bajamar certainly comes handy for school kids and others during the Spanish three hour Siesta break. One would think that the world is still in order at Beach Playa Bajamar. Being at the other end of the island it might never be overcrowded by island explorers. Beach Bajamar and its improved rock pools are not far from Tenerife Island's central, biggest resort Puerto de la Cruz and La Orotava. Less than 40 minutes should lead you to Playa Baja Mar from there. I would rent a car for this which comes with a map where you will confirm my directions given above. Café Palmelita Bajamar Tel.692256099 right opposite the entrance steps of the lido of Playa of Bajamar with its pools is said to belong to the same owners like Melita Café which you pass when you continue towards Punta de Hidalgo. Both cafes offer one of best apple pies and many more delicious cakes and excellent ice cream. 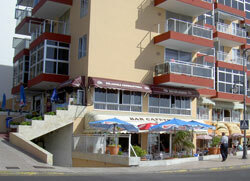 These establishments who represent Melitta coffee are part of two more Melita Cafes on Tenerife Island. Already, I sampled this during a trip to the sea side shores Bajamar, 4 years ago. More information on resources is given by the Bajamar Tourist office at tel. : + 34 922 176002. Its Beach and natural swimming pools go hand in hand. They provide extra fun at the edge of a pretty wild seashore for young and old. Where sleep near Beach Bajamar? Alternatively, discover the much more exciting Nirvana Hotel in the context of Tenerife romantic holidays in La Laguna by clicking here. If you want to see a beach complex with another face, go from Playa Bajamar beach to the man made Martianez lakes which have an entirely different charm. From Playa Bajamar back to Tenerife beaches. The best information on Bajamar I could find is only available in Spanish here.